Democrats have gone from the party of the New Deal to a party that is defending mass inequality. The Democratic Party was once the party of the New Deal and the ally of organized labor. But by the time of Bill Clinton's presidency, it had become the enemy of New Deal programs like welfare and Social Security and the champion of free trade deals. What explains this apparent reversal? 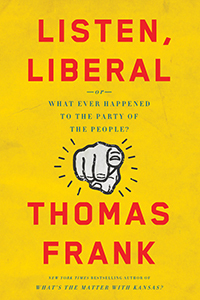 Thomas Frank—best known for his analysis of the Republican Party base in What's the Matter with Kansas?—attempts to answer this question in his latest book, Listen Liberal: Or, What Ever Happened to the Party of the People? According to Frank, popular explanations which blame corporate lobby groups and the growing power of money in politics are insufficient. Frank instead points to a decision by Democratic Party elites in the 1970s to marginalize labor unions and transform from the party of the working class to the party of the professional class. In so doing, the Democratic Party radically changed the way it understood social problems and how to solve them, trading in the principle of solidarity for the principle of competitive individualism and meritocracy. The end result is that the party which created the New Deal and helped create the middle class has now become “the party of mass inequality.” In These Times spoke with Frank recently about the book via telephone. Listen Liberal: Or, What Ever Happened to the Party of the People? A lot of progressives that I talk to are pretty familiar with the idea that the Democratic Party is no longer protecting the interests of workers, but it’s pretty common for us to blame it on mainly the power of money in politics. But you start the book in chapter one by arguing there’s actually something much deeper going on. Can you say something about that? All of this happened because of the civil war within the Democratic Party. They fought with each other all the time in the ’70s and the ’80s. One side hadn’t completely captured the party until Bill Clinton came along in the ’90s. That was a moment of victory for them. Bill Clinton’s presidency is what progressives usually cite as the time when things went bad. But there’s a trend that goes back to the ’70s, right? Historians always cite the ’68 election as the turning point. The party was torn apart by the controversy over the Vietnam war, protesters were in the streets in Chicago and the Democratic candidate Hubert Humphrey went on to lose. Democrats thought this was terrible, and it was. So they set up a commission to reorganize the party, the McGovern Commission. The McGovern Commission basically set up our modern system of primaries. Before the commission, we didn’t have these long primary contests in state after state after state. Primaries are a good thing, as were most things the McGovern Commission did. But they also removed organized labor from its structural position of power in the Democratic Party. There was a lot of resentment towards labor during the Vietnam War. A lot of unions took President Johnson’s side on Vietnam. There was also this sense—which I think was correct at the time—that labor was a dinosaur, that it was out of touch and undemocratic and very white. There were a lot of reasonable objections to organized labor at the time. The problem is, when you get rid of labor in your party, you also get rid of issues that matter to working people. That’s the basic mistake that Democrats made in the ’70s. Of course, labor still is a big part of the Democratic coalition—it gives them their money, it helps out at election time in a huge way. But unions no longer have the presence in party councils that they used to. That disappeared. One of the most shocking quotes in the book is from Alfred Kahn, an advisor to Jimmy Carter, who said, “I’d love the Teamsters to be worse off. I’d love the automobile workers to be worse off.” He then basically says that unionized workers are exploiting other workers. Isn’t that amazing? He’s describing a situation in the 1970s. There was all this controversy in the 1970s about labor versus management—this was the last decade where those fights were front and center in our national politics. And he’s coming down squarely on the side of management in those fights. And remember, Kahn was a very important figure in the Carter administration. The way that he describes unions is incorrect—he’s actually describing professionals. Professionals are a protected class that you can’t do anything about—they’re protected by the laws of every state that dictate who can practice in these fields. It’s funny that he projects that onto organized labor and holds them responsible for the sins of another group. This is a Democrat in an administration that is actually not very liberal. This is the administration that carried out the first of the big deregulations. This is the administration that had the great big capital gains tax cuts, that carried out the austerity plan that saw the Federal Reserve jack its interest rates sky high. They clubbed the economy to the ground in order to stop “wage inflation,” in which workers, if they have enough power, can keep demanding higher wages. It was incredible. To go back to your point about education: At one point you quote Arne Duncan, who was Obama’s secretary of education, saying that the only way to end poverty is through education. Why can’t that work? The big overarching problem of our time is inequality. If you look at historical charts of productivity and wage growth, these two things went hand in hand for decades after World War II, which we think of as a prosperous, middle-class time when even people with a high school degree, blue-collar workers, could lead a middle class life. And then everything went wrong in the 1970s. Productivity continued to go up and wage growth stopped. Wage growth has basically been flat ever since then. But productivity goes up by leaps and bounds all the time. We have all of these wonderful technological advances. Workers are more productive than ever but they haven’t benefited from it. That’s the core problem of inequality. Now, if the problem was that workers weren’t educated enough, weren’t smart enough, productivity would not be going up. But that productivity line is still going up. So we can see that education is not the issue. It’s important that people get an education, of course. I spent 25 years of my life getting an education. It’s basic to me. It’s a fundamental human right that people should have the right to pursue whatever they want to the maximum extent of their individual potential. But the idea that this is what is holding them back is simply incorrect as a matter of fact. What’s holding them back is that they don’t have the power to demand higher wages. If we talk about the problem as one of education rather than power, then the blame goes back to these workers. They just didn’t go out and work hard and do their homework and get a gold star from their teacher. If you take the education explanation for inequality, ultimately you’re blaming the victims themselves. Unfortunately, that is the Democratic view. That’s why Democrats have essentially become the party of mass inequality. They don’t really have a problem with it. So really, the solution would have to be solidarity and organized power. That was an essential point that I try to make in Listen Liberal: that there is no solidarity in a meritocracy. A meritocracy really is every man for himself. Don’t get me wrong. People at the top of the meritocracy, professionals, obviously have enormous respect for one another. That is the nature of professional meritocracy. They have enormous respect for the people at the top, but they feel very little solidarity for people beneath them who don’t rise in the meritocracy. Look at the white-collar workplace. If some professional gets fired, the other professionals don’t rally around and go on strike or protest or something like that. They just don’t do that. They feel no solidarity because everything goes back to you and whether or not you’ve made the grade. If somebody gets fired, they must’ve deserved it somehow. I have my own personal experience. Look at academia over the last 20 years. They’re cranking out these Ph.D.s in the humanities who can’t get jobs on tenure track and instead have to work as adjuncts for very low pay, no benefits. One of the fascinating parts about this is that, with a few exceptions, the people who do have tenure-track jobs and are at the top of their fields, do very little about what’s happened to their colleagues who work as adjuncts. Essentially this is the Uberizing of higher education. The professionals who are in a position of authority have done almost nothing about it. There are academics here and there who feel bad about what’s happened to adjuncts and do say things about it, but by and large, overall, there is no solidarity in that meritocracy. They just don’t care. Do you think there’s a connection between the fact that the Democratic Party has turned against workers and the rise of Donald Trump? Yes. Because if you look at the polling, Trump is winning the votes of a lot of people who used to be Democrats. These white, working-class people are his main base of support. As a group, these people were once Democrats all over the country. These are Franklin Roosevelt’s people. These are the people that the Democrats essentially decided to turn their backs on back in the 1970s. They call them the legatees of the New Deal. They were done with these guys, and now look what’s happened—they’ve gone with Donald Trump. That’s frightening and horrifying. But Trump talks about their issues in a way that they find compelling, especially the trade issue. When he talks about trade, they believe him. Ironically, he’s saying the same things that Hillary Clinton and Bernie Sanders are saying about trade, but for whatever reason people find him more believable on this subject than they do Hillary Clinton. Do you think that the rise of the Bernie campaign could herald a new era in the history of the Democratic Party? I hope so. Both Trump and Bernie are turning their respective parties upside down. What Bernie is doing is very impressive. I interviewed him a few years ago and have always admired him. I think he’s a great man. To think that he could beat a Clinton in a Democratic primary anywhere in this country, let alone many primaries, was unthinkable a short time ago. And he’s done it without any Wall Street or big-business backing. That is extraordinary. It shows the kind of desperation that’s out there. He has shown the way, and whether he gets the nomination or not (he probably won’t), there’ll be another Bernie four years from now. And there’ll also be another Trump. The Republican Party is being turned on its head much more violently than the Democrats. Hillary will probably get the nomination. I live in Washington, D.C., and I spend time around Hillary-style Democrats. They really think that they’ve got this thing in the bag. And I don’t just mean her versus Bernie. I mean the Democratic Party winning the presidency for the rest of our lives. From here to eternity. They can choose whoever they want. They could nominate anybody and they would win. They think they’re in charge. One of your villains from the ’70s is Frederick Dutton, who wrote a book about how the Democratic Party needed to realign itself. You have a quote from him saying, “Every major realignment in U.S. political history has been accompanied by the coming of a large new group into the electorate.” You’re very critical of how he uses that idea in the ‘70s. But if you look at the newer voters attached to the Bernie campaign, it looks like the Democratic Party is experiencing something like that now. Yes, in both cases you’re talking about a generational shift. That’s what he meant in 1971. He was talking about the counterculture and the “Now Generation” and the idea that they would come into the electorate and demand a different kind of politics—specifically his kind of politics. Everybody always sees this new group that’s coming in as supporting what they want. That’s what he thought. I have a certain amount of contempt for that. Many years ago I wrote a book about the counterculture and how it was used for this purpose—specifically by the advertising industry. But Bernie’s doing the same thing. He’s using it for his own purposes. Millenials’ take on the world is fascinating. Just a few years ago, people thought of them as very different. But now they’re coming out of college with enormous student debt, and they’re discovering that the job market is casualized and Uberized. The work that they do is completely casual. The idea of having a middle-class lifestyle in that situation is completely off the table for them. Every time I think about these people, it burns me up. It makes me so angry what we’ve done to them as a society. It really gives the lie to Democratic Party platitudes about the world an education will open up for you. That path just doesn’t work anymore. Millenials can see that in their own lives very plainly. So I’m very excited that they’re pro-Bernie. They really are the future. Tobita Chow is chair of The People’s Lobby, an independent political organization based in Chicago, and co-author of “The Movement We Need,” a pamphlet on analysis and strategy for the progressive movement. He has been involved in faith-based community organizing on the South Side of Chicago since 2009, and is a leader in the “Moral Mondays Illinois” campaign against state budget cuts. He is an MDiv student at the Lutheran School of Theology at Chicago.